copy and paste as art work. It will copy to A6. Ed. C00005 NEW WEBSITE – www.writetothem.com Write to your politicians, national or local, for free. Built by MySociety, part of UK Citizens Online Democracy, a registered charity. www.mysociety.org. C00003 Activist Post – Natural Resources Defense Council Takes Action Against FCC Regarding 5G Small Cell Tower Installation — Requesting Statements From Concerned Citizens. Pub. June 19 2018 Added 21 June 2018. 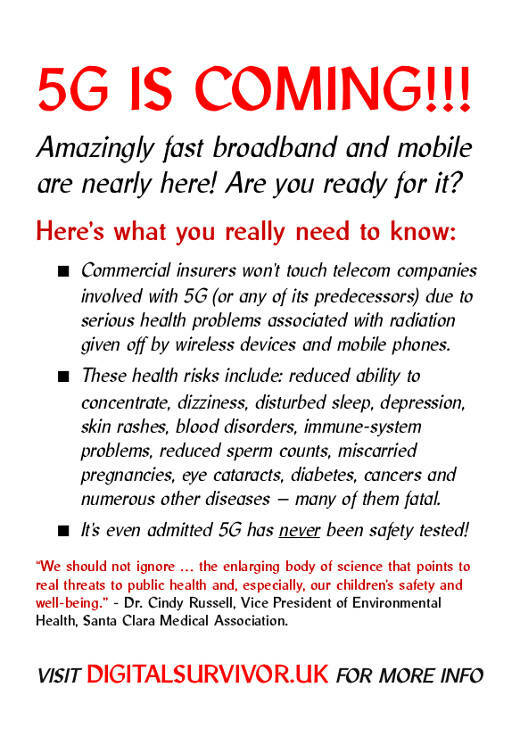 C00002 From Zero5G.coom Take Action (International) Send your legislator or MP this text: “I am a constituent in your district and want you to oppose and prohibit the expansion of wireless radiation and 5G millimeter wave technology. C00001 Draft leaflet for UK Mass Action. The UK government and the utility companies are forcing the public to accept 5G technology. They claim that it will bring faster broadband, better connectivity and enable us to have the “Internet of things”, driver-less cars, etc. But what they are not telling us are the financial costs, the health risks and the impact on our environment. 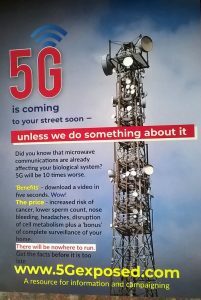 5G leaflets. Every sentence, every word, every effort of informing people by an individual makes a difference although the effects may not be perceived. We shall be making available in due course flyers for publicity, instructions and suggestions for having local meetings, anything to get the word around before their system gets fully embedded. The situation may seem impossible with the 5G proponents lined up throughout the world licking their lips in anticipation of the profits but like David and Goliath, the solution may come about in other ways. At this stage we do need to get the word around. Would you be willing to distribute some of these posters to your neighbourhood posting them through doors or even giving them to people in shops. I can guarantee you that most people haven’t a clue what’s going on and we will all be most grateful that more people are taking the initiative of being the bearer of news, bad though it may be. The leaflet and its appearance will add authenticity to your words. I can provide 1000 leaflets for around £35 but if you want more, it will be possible to provide this for very little extra. Please talk to me and ask me for a quote and I will do my very best. you need to pay me by PayPal using the box on the contact page or preferably bank transfer. You will get your order the next day. PS Next bulk order will be 1 April. The more people order them the lower the price. I am considering running the front page and giving the opportunity for you to print some local information on the reverse, for example a local meeting.